The inclement weather conditions prevailing in the upper region for the past three days worsened today as the entire upper Manali region experienced a fresh spell of snow, leading to a fall in the day temperature. The state government’s effort to introduce English medium in 100 government schools in Hamirpur district has received a setback as the Himachal Pradesh Board of School Education (HPBSE) has failed to print books on the pattern. The Himachal Police investigating the Karmapa case has tried to ascertain the authenticity of the 17th Karmapa, Uygen Trinley Dorjee. Highly placed sources here told The Tribune that police officials had summoned the secretary from the office of Tai Situ Rinpoche, the mentor of the 17th Karmapa, to produce documents in which the 16th Karmapa had declared Dorjee as his successor. Activists of the Youth Congress held a protest against the poor condition of the Mehatpur-Una-Amb road here today. 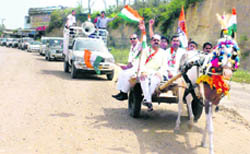 The workers hired a horse cart to trek the road as a symbol of their protest. The Archaeological Survey of India has not given any concrete response to the state’s proposal for relocation of temples in Bilaspur which were submerged in the Bhakra Dam reservoir. Central Minister and former Chief Minister Virbhadra Singh has revoked the suspension of former city Congress president Hussein Ali, a prominent Muslim youth leader and staunch Virbhadra Singh supporter. The HP High Court today restrained members of the managing committee of Himalayan International School from selling, mortgaging or alienating this prime property situated in the Charbarra area of Shimla. A team of officials led by drug controller Navneet Marwaha seized a huge cache of sedatives comprising cough syrups and capsules from the residence of a Baddi-based chemist Jitender Pal here today. Houses of two villagers, Nikka Ram and Sukhdev, caught fire in Kudswaaye village in the gram panchayat of Barotta near Ghumarwin, 55 km from here, yesterday. A 20-year-old nursing student from Mandi district was found hanging in her hostel room in Dr RP Government Medical College at Tanda here today. The deceased has been identified as Kashmira. The higher reaches in the Manali region, including 13,050-feet Rohtang Pass, the gateway to Lahaul-Spiti, the Pir Panjal ranges, Marhi, Gulaba, Brighu slopes, Beas Kund, Dhundi and Hamta ski slopes, received a fresh snowfall. Hundreds of tourists, who had come to the hill station to beat the heat, enjoyed snow at “snow point”. 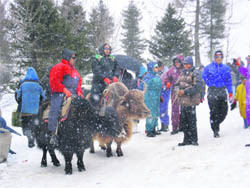 A festive atmosphere prevailed in Kothi and Gulaba as tourists were seen enjoying yak and horse rides, snow skiing and making snowmen. According to the Border Roads Organisation (BRO), the fresh snowfall in the upper region disrupted the snow-clearing operations on the Manali-Rohtang Pass road. The BRO, till yesterday, had cleared the snow near the Beas nullah, 32 km from here. DALHOUSIE: The high peaks of Chamba district, including Bharmour and Pangi regions and the adjacent ranges of Pir Panjal mountains, experienced a fresh snowfall last night. The sacred shrine of Manimahesh mountains in the Bharmour region, besides Saach Pass and Padhri Pass, which adjoin Chamba district of Himachal Pradesh with Doda district of J&K, also experienced a heavy snowfall. Intense cold wave conditions prevailed in the lower areas, reports from the district headquarters said, adding that residents in the hilly terrains confined to their homes to protect themselves from the extreme cold. The heavy snowfall in the high altitude ranges of the district has brought happiness to orchardists and farmers of the district as snow is good for apple and other fruit crops, besides the wheat crop. The temperature has plummeted in the region, the reports added. Due to delay in printing of books in the English medium, 2000 students will not be able to study their courses. The state government had decided to introduce English medium in 70 schools of Hamirpur district from class first to fifth for which books in the English medium were to be provided by the HPBSE. To compete with private schools and bring the government schools on a par with these, the state government had taken the initiative to introduce the English medium in these schools in a phased manner. The books for the English medium were to be prepared by teachers under the Sarva Shiksha Abhiyan (SSA) and to be printed by the HPBSE. Though the session in these schools has already started, the books for the different classes in the English medium have not been provided till now. According to information, since it will take quite some time to print the books, it will not be possible to provide those desirous of switching over to the English medium. The Himachal Police investigating the Karmapa case has tried to ascertain the authenticity of the 17th Karmapa, Uygen Trinley Dorjee. Highly placed sources here told The Tribune that police officials had summoned the secretary from the office of Tai Situ Rinpoche, the mentor of the 17th Karmapa, to produce documents in which the 16th Karmapa had declared Dorjee as his successor. The office of Tai Situ Rinpoche has, however, not responded to the police notice as yet. SP, Una, Sumedha Dwedi, however, denied any knowledge about the summons. She said: “I have not issued any such notice. It might have been done during the stint of my predecessor”, she said. Tibetans have expressed shock at the notice. While talking to The Tribune they alleged that the police should not exceed its limit by questioning the religious beliefs of the Tibetans. The police efforts to adjudicate the authenticity of the 17th Karmapa has brought to the fore the internal rivalry of Karma Kagyu sect teachers Tai Situ Rinpoche and Shamar Rinpoche. Rinpoche is believed to have managed the escape of Uygen Trinley Dorjee from China in 1999. He wanted to take him to Rumtek monastery in Sikkim that is the traditional seat of the Karmapa in India. However, the Government of India did not allow Dorjee to move to Rumtek allegedly under the influence of Shamar Rinpoche. Shamar, who was second in command to the 16th Karmapa, is in control of the Rumtek monastery. He has installed Thai Trinley Dorjee as the 17th Karmapa and is questioning the authenticity of Uygen Trinley Dorjee. However, Dorjee, who has been staying at Dharamsala in a monastery owned by the Central Tibetan administration, has also been recognised by the Dalai Lama. He is the only reincarnated lama who is recognized both by the Dalai Lama and the Chinese government. Sources here said the Shamar Rinpoche is still lobbying with the Dalai Lama to get his Karmapa recognized. He allegedly wrote to the Dalai Lama in December last year requesting him to recognise the Thai Trinley Dorjee as the real Karmapa. The sources here also told The Tribune that after the recent Karmapa controversy, the Tibetan authorities have urged the Government of India to settle the controversy and recognise Uygen Trinley Dorjee, who also has the support of the Dalai Lama as the real Karmapa. Many followers of the 17th Karmapa has also requested the Government to India to allow him to visit Rumtek. The permission has, however, not been given as yet. However, now it remains to be seen if the Himachal Police is able to settle the controversy regarding the authenticity of the real reincarnation of the Karmapa. Spokesperson for the state Youth Congress Sanjeev Saini said commuters and residents had been suffering due to delay in the construction of the road. People having business establishments and houses along the road had been suffering due to dust that emanated from the broken portions of the road, he added. The road is being constructed by Chinese company Longjian. Sources said according to the norms, the company officials should have constructed the road in stretches to minimise discomfort to the commuters. However, they have uprooted the entire road. Earlier, the company had come in for criticism for failing to take road safety measures in the uprooted portions. The executive engineer, supervising the construction works, however, maintained that efforts were being made to complete at least one lane of the road at the earliest. However, the much-delayed road project is now testing the patience of commuters. Stating this during Question Hour, Chief Minister PK Dhumal said the matter had been taken up many times and last February, a team of the ASI visited Bilaspur in this connection but there had been no progress. These temples submerged for sometime every year when the level in the reservoir was high. The state could not do much in the matter as everything had to be done with the permission of the ASI. He also informed the House that the state had sent a proposal to declare eight more important sites as protected monuments. He said the government spent Rs 7.39 crore on the renovation of old temples and buildings over the past three years. While Rs 3.66 crore was spent on temples, Rs 3.72 crore was provided for the restoration of the historic Gaiety Theatre. Replying to another question, he said 2,456 women had gone missing over the past three years out of which 532 women could not be traced. He said the government proposed to set up anti-human trafficking units in Shimla, Solan, Kullu, Kangra and Chamba in a phased manner under a scheme of the Centre. In all, 7 cases were registered under the Prevention of Immoral Trafficking Act over the period. After questioning this action, he said, “Who did it and why?” He immediately ordered the district Congress president Santosh Dhiman, who was present there, to order cancellation of this order at the earliest and restore his membership as usual. Passing this interim order, a Division Bench comprising Chief Justice Kurian Joseph and Justice Sanjay Karol further directed the principal secretary (Revenue) and the deputy commissioner, Shimla, to file their reply and listed the matter on May 23. The court passed this order on a petition highlighting the flagrant violation of the land laws and rules committed by the managing committee of the school to acquire the prime land, which is situated in a high-security zone near the President of India Retreat in collusion with some government officials. The petitioner further alleged that the managing committee had flagrantly violated the provisions of the HP Tenancy and Land Reforms Act, 1972, and were involved in “benami” transactions. It is further alleged that a big chunk of land situated in the posh Chharabra area is a benami transaction, because of which all members of the managing committee have tried to shut down the school running there since 1997. The petitioner urged the court to declare all such transactions pertaining to this land as benani transactions with further directions to government officials that the land should be ordered to be vested in the state of HP as per the land law. The petitioner also urged the court to inquire into the matter and take appropriate action against the culprits, who are involved in the benani transactions. Marwaha said 16,000 capsules were stored in the home of the said chemist, who ran a chemist shop, New Kaushal Medical Store, near Sabzi Mandi in Baddi. The officials raided Pal’s residence after they found his shop closed. The officials comprising drug inspector Garima Sharma and policemen recovered 25 bottles of Rexnol, 49 bottles of Rexcof, 52 bottles of Corex cough syrup along with 30,000 tablets of Microlit, 2,030 capsules of Parvon Spas, 1,080 capsules of Broxyvyon and 12,384 capsules of Spasmo Proxyvon. A case under Section 18-C and 18-A of the Drugs and Cosmetics Act for storing drugs without licence and for failing to show purchase records has been registered. The presence of sedative drugs in such a large quantity has shocked the authorities concerned. Property worth Rs 3 lakh got destroyed in the incident. Villagers noticed the fire after smoke billowed out from the top of the house of Nikka Ram. They tried their best to bring the fire under control, but it spread quickly and almost everything got destroyed in the fire before the fire brigade reached the spot. The cause of the fire has not been ascertained yet. The police has registered a case and is investigating the matter. The medical superintendent of Dr RP Government Medical College Hospital, Dr SB Sood, said Kashmira, a 2nd year student of nursing in the college, was on night duty last night. She came to her hostel room in the morning and asked for the breakfast. He said her roommate took the breakfast and left for her duty. Kashmira had a class at 10 am and when she did not come, her classmates knocked at her door. When she did not respond, they peeped through the window and found her hanging from the ceiling fan of the room. Kanga district police chief Deljit Singh Thakur said the police was investigating the matter and no suicide note was recovered from the room. The SSP said a team of forensic science experts was also rushed to the college. The father of the girl, Chuni Lal, who arrived here this afternoon, termed it a case of harassment. The police could not establish the cause behind the incident. The body has been sent for a post-mortem. A resident of Nagari village died under mysterious circumstances here today. According to the police, the victim identified as Vinod Kumar, who was lying on the roadside, was taken to the Chamunda health centre, from where he was referred to Tanda Medical College Hospital. He was declared brought dead by the hospital authorities. He was identified from the bank passbook that was recovered from his pocket. His family members were informed by the police and the body sent for a postmortem. Kanga district police chief Deljit Singh Thakur said the police was investigating into the matter.